Continue reading, you will get the answer at The End. Race started between rabbit and tortoise. Rabbit thought that he could easily win the race, since tortoise is slow enough to win. So rabbit slept for a while, due to its laziness and over confident. Tortoise may be slow but it is not lazy, it tried persistently and reached the target point and won the race. Rabbit realised his mistake of being lazy and over confident. Rabbit again called tortoise for the running competition. This time rabbit won the race. Tortoise realized his weak point of being slow and found out his strength. 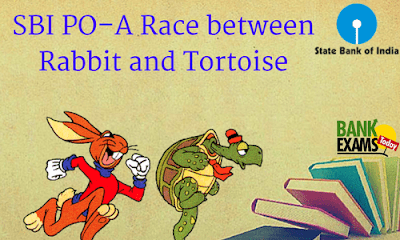 This time tortoise called rabbit for the race by fixing a target point, which is on the other side of the pond. The race got started, rabbit reached soon till the pond but he couldn’t able to cross the pond to reach the target point. Tortoise though it came slow, he swim med across the pond and won the race. This time both rabbit and tortoise planned to win the time. On land rabbit carried tortoise on its back and reached till the pond. In pond tortoise carried rabbit on its back and reached the target point. Such that they both reached their target point in a fraction of minutes. Told you in the beginning that you will know who is rabbit and who is tortoise at The End. Now most of you would have got the answer for those two questions. Yes!!! If you are rabbit we will be tortoise and if you are tortoise we will be rabbit. So just analyze your weak and strong areas. Use our materials to turn your weaknesses into your strengths. Crack SBI PO easily.